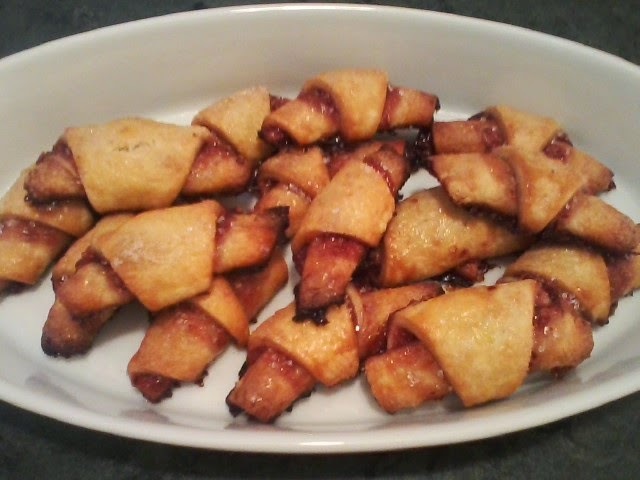 Recipe #116: Rugelach...Apricot, Raspberry, Chocolate Espresso...Take Your Pick!!! Put cream cheese and butter in the bowl of a mixer and blend until light. Add the 1/4 cup sugar and salt. With mixer on low speed, add the flour and mix just until combined. Dump the dough out onto a well-floured surface (I use my counter) and roll into a ball. Cut the ball into quarters and wrap each in plastic wrap. Refrigerate for at least one hour. For the filling, combine in a small bowl, 1/4 cup sugar and the 1/4 cup brown sugar. 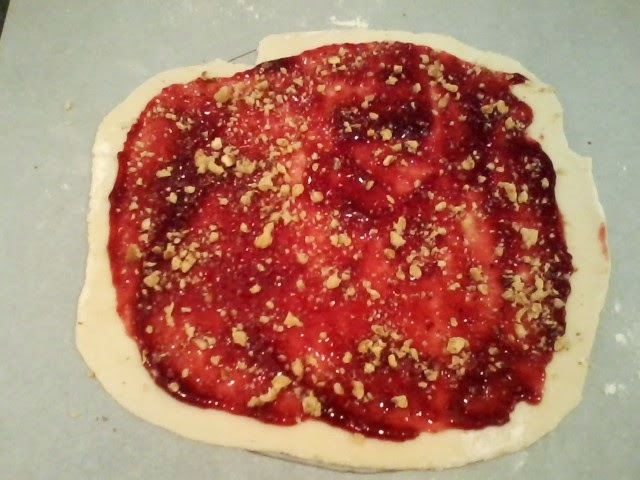 In another small bowl, give the apricot filling or the raspberry preserves a stir, along with the almond extract. 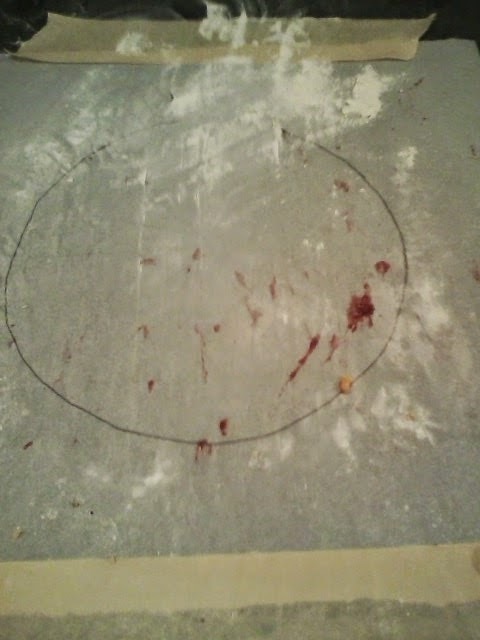 Take dough out of frig and roll each quarter into a 9" circle. Spread the dough 1/4 cup filling and then sprinkle with 1/4 of the sugar. 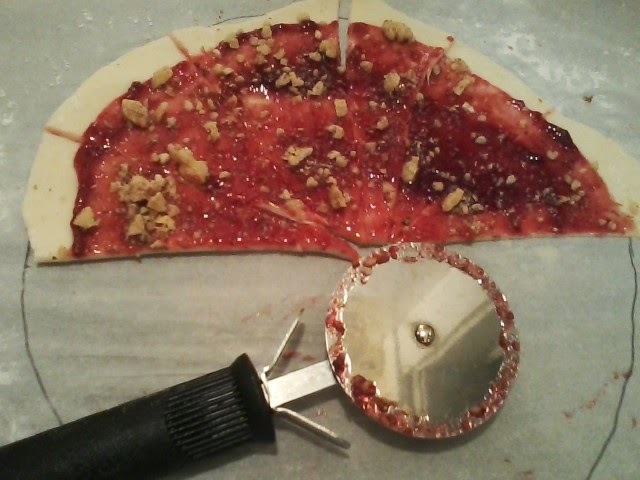 Press the sugar slightly onto the filling with the rolling pin. At this point, I use a pizza cutter and slice the round in quarters, then another three, totaling 12 wedges. 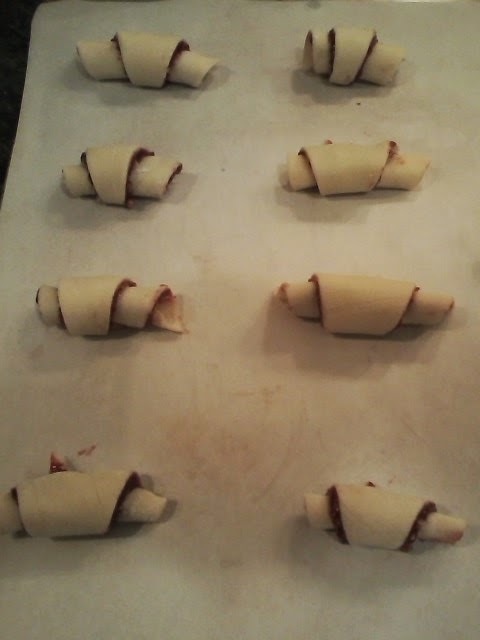 Roll up each wedge, starting at the widest part. 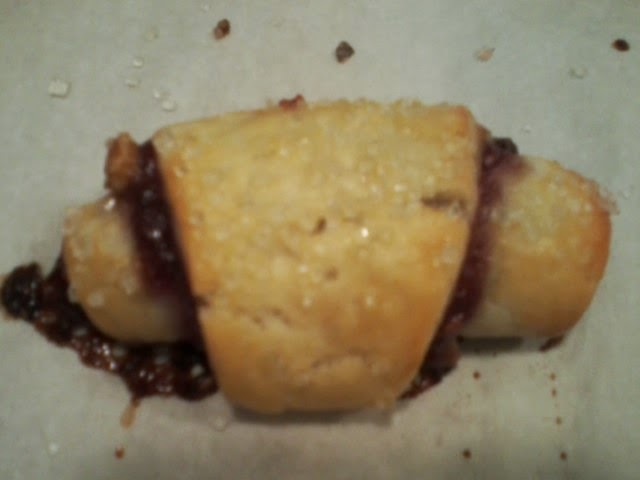 Place on a baking sheet lined with parchment paper with side down. Put in the fridge for about half hour. Since I have a side-by-side, I have to use a small cookie sheet, then transfer the cookies to my larger cookie sheet. It's a real pain, but I have no choice. Take cookies out and brush with egg wash. At this point, you can sprinkle sanding sugar or regular sugar on top, or nothing if you don't want to. Bake in a 350 oven for 15-20 minutes, or until lightly browned. Remove to a wire rack and cool. Bon appetit!